happy memorial day weekend! i hope that you get to spend time outdoors, grilling out or vacationing with family and friends. this weekend chad and i will not be going up to the family cabin, rather just hang low with some friends and celebrate my birthday with my side of the family! however, i hope that we do get to get some grilling in. i made this a few weeks ago on the grill and it turned out great. so, if you are looking for a good grill recipe, you have met your match ;) i made this for just the two of us, but if you needed to make more, just double or triple the recipe! 1. heat the grill to medium, fold two 4-foot sheets of aluminium foil in half. put potatoes on each layer. cover potatoes, crimp the edges and ensure it is sealed. put on the grill. cook for 25 minutes, flipping half way through. 2. while potatoes are cooking, make the chicken marinade. whisk together oil, wine, garlic, vinegar, and thyme. add chicken to the marinade and let marinate for 10-30 minutes. 3. put chicken on the grill and cook until browned and cooked through. 4. remove potatoes from the grill, mix with butter and garlic powder. serve with a salad and if you so desire, beer goes great with this meal! what are your plans for memorial day weekend? any good food you plan on making? This looks delish!!! Thanks for sharing! Mmm That sounds yummy. I love grilling mix veggies and potatoes on the grill too. I hope you have a great Memorial Day weekend! 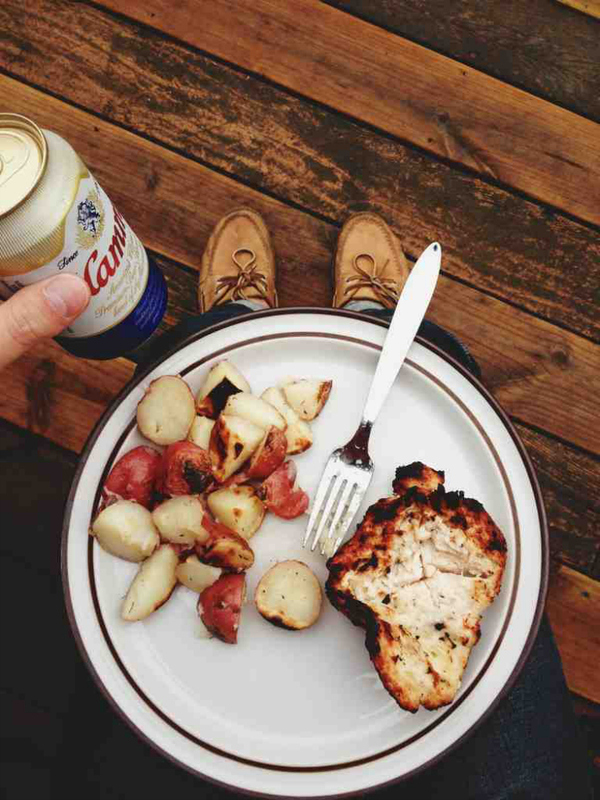 Okay first I love that this person is drinking a nasty Hamm's hehe second this looks delicious and I'm pinning it now!! I want to go to the lake but rain is in the forecast which really stinks for the long weekend!! Have a fun b.day celebration and thanks for sharing. Have a super happy birthday weekend!!! We are definitely getting our grill on this weekend! Staying close to home is such a nice change from the hustle of traveling!! This looks & sounds absolutely delicious!! Just pinned it!